The Department of Aesthetics and Art History was established in 1949 with the start of the new Faculty of Fine Arts at Tokyo Geijutsu Daigaku, replacing the teachers’ course under the previous Tokyo Fine Arts School. Since its founding, the Tokyo Fine Arts School had made important contributions to the study of art history and aesthetics in modern Japan. With the establishment of the new university, this academic field was made into an independent Department of Aesthetics and Art History. From its founding, the objective of the Department of Aesthetics and Art History has been to develop individuals capable of integrating art theory and practice. It has steadfastly maintained this fundamental policy up to the present day. At the same time, the department’s organization has developed with a focus on developing a full understanding of aesthetics and art history. Various related courses such as Artistic Anatomy have been established around this core. Under this structure, the Department of Aesthetics and Art History has graduated large numbers of outstanding figures in a wide range of arts-related fields, including art-museum curators, art critics, researchers, and journalists. Based on this history, the educational philosophy of today’s Department is to develop individuals capable of contributing in a wide range of artistic fields through theoretical analysis and interpretation, by deepening awareness of various related fields revolving around art, by gaining experience in creating their own works, and through training in aesthetics and art history. 1． In the first year, students acquire knowledge and basic practical techniques in aesthetics and art history through the study of “Basic Practical Techniques” in Art I and Seminars in Aesthetics and Art History I and II. 2． Students of the Department of Aesthetics and Art History study “Basic Practical Techniques” in Art II A and B, “Classical Fine Arts Research” (Seminars and Research Trip) in the second year, expand their knowledge about fundamental practical techniques, and gain insights into the classical fine arts of Japan. 3． During the first to third year, students of the Department of Aesthetics and Art History study designated subjects (“An Introduction to the History of Fine Arts,” “Aesthetics,” and “An Introduction to Aesthetics”), take common courses, and learn foreign languages, acquiring the fundamental skills to study aesthetics and art history. 4． Over a course of four years, students of the Department of Aesthetics and Art History attend special lectures and seminars in aesthetics and art history and acquire specialized knowledge about aesthetics and art history. 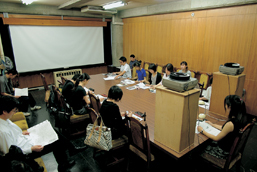 5． By the third year, students of the Department of Aesthetics and Art History obtain the stipulated credits in the abovementioned points (1–4) and identify their research fields from among the areas of Aesthetics, Japanese and Asian Art History, Western Art History, and History of Crafts). 6． Students of the Department of Aesthetics and Art History are required to attend the “Thesis Writing Seminar” and write the dissertation in the graduation year. Under the guidance of the faculty members in each field, students identify the theme based on their awareness of the issues and write a thesis, which is a culmination of their research studies. 1． In the Master’s Program, students attend special lectures and seminars in their research field, and other special seminars and lectures that allow them to acquire advanced knowledge and research skills. 2． In the Master’s Program, students acquire presentation and discussion skills that are required as researchers through the presentation of research results in the course seminars. 3． In the Master’s Program, students are required to complete the Master’s thesis and position their research within the specialized field. 1． In the Doctoral Program, students are required to enhance their highly specialized knowledge through comprehensive creative research, special lectures and seminars, and special research and guidance in their research area. 2． In the Doctoral Program, students are required to proactively conduct thesis presentations and research presentations, narrow down the research achievements within the specialized area, and acquire skills to become independent professionals. 3． In the Doctoral Program, students must acquire a broad range of knowledge and liberal arts perspectives in not only their specialized area but also other relevant areas. 4． In the Doctoral Program, students are required to improve their research execution capabilities on their own, orienting themselves toward the completion of the doctoral thesis. 1． Students of the Department of Aesthetics and Art History are required to be enrolled for the stipulated period, study the various lectures prescribed in the curriculum policy, and obtain the required credits. 2． Students of the Department of Aesthetics and Art History are awarded the Bachelor’s degree after the submission of the graduation thesis. The thesis must sufficiently demonstrate fundamental abilities of theoretical analysis and interpretation in the field of art. The full-time faculty of the concerned department and division will review the graduation thesis for the conferment of the degree. 1. In the Master’s Program, students are required to be enrolled for the stipulated period, study the various lectures prescribed in the curriculum policy, and obtain the required credits. 2. In the Master’s Program, students are awarded the Master’s degree after submission of the Master’s thesis. The Master’s thesis must demonstrate an accurate understanding and investigation of the research trends, appropriate research methodology suited to the research theme, logical consistency, and originality. The Thesis Review Committee evaluates the Master’s thesis for the degree conferment. 1． In the Doctoral Program, students are required to be enrolled for more than the stipulated period, study the various lectures prescribed in the curriculum policy, and obtain the required credits. 2． In the Doctoral Program, students are awarded the doctoral degree after submission of the doctoral dissertation. The doctoral dissertation must have a high level of originality that contributes new knowledge in the concerned specialized field. The doctoral degree is awarded once the Thesis Review Committee has assessed the doctoral dissertation, the Studio Committee has granted approval, and the dissertation has been judged as competent. Further, public presentation and the final examination is a compulsory part of the degree review. The educational research system consists of four research laboratories in Aesthetics, Japanese and Asian Art History, Western Art History, and History of Crafts. In first and second years of the undergraduate program, the curriculum is designed to facilitate the acquisition of a broad range of knowledge related to the fine arts. As they advance through their third and fourth years, the students identify their own specialized research areas; in the fourth year, students are expected to write their dissertation in their own specialized research areas, with guidance in the specialized research area from the laboratories. At the Graduate School, students receive guidance from faculty members in the laboratory to which the students are assigned depending on the area of specialization. The goal of the Master’s Program is to enable students to write a research paper with a more advanced degree of specialization. In the doctoral program, students are expected to acquire the ability to present their own results as researchers. The department’s educational and research structure consists of four studios established in the fields of aesthetics, Japanese and Asian art history, Western art history, and history of crafts. The curriculum for first- and second-year undergraduates has been designed to familiarize students with a broad range of knowledge related to art. As they advance through their third and fourth years, students identify their own specialized research domains; in their fourth year, students are expected to write dissertations in their own specialized domains, with guidance from the studios. Postgraduate students receive guidance from instructors in studios to which they are assigned, depending on their areas of specialization. The goal of the master’s degree program is to write a research paper with a more advanced degree of specialization. In doctoral programs, students are expected to acquire the capacity to present their own results as researchers. The undergraduate curriculum has been designed to familiarize students with a broad range of knowledge in aesthetics and art history as students also gain experience in creating their own works of art, thereby enabling students to understand abilities that serve as the foundations for more specialized research in graduate school. 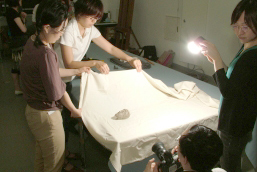 In the first and second years, all students are required to learn practical techniques in the fields of Japanese painting, oil painting, and sculpture. Students are also expected to gain basic knowledge in the areas of aesthetics, Japanese and Asian art history, and Western art history and to acquire the language skills needed to read and discuss the literature. In the second year, students are required to travel on a research trip to the university’s Institute of Ancient Art Research in Nara, Japan. The goal of studies in the third year and beyond is to allow students to attain more highly specialized knowledge through seminars and special lectures held in the aesthetics and art-history studios. During the fourth year, each studio provides individual guidance in writing graduation theses. Each studio holds general courses on aesthetics and art history as well as more specialized seminars and special lectures to implement this curriculum. In the master’s degree program, students are assigned for two years to specific studios to acquire a deeper, more specialized knowledge through seminars and special lectures. Each student is expected to give presentations on topics assigned based on the content of his or her own research, with guidance and support from the studio. In the final year of the program, students write a master’s thesis with individual guidance from instructors. The objective of doctoral programs is to help each student develop the research abilities needed to generate his or her own results, in each student’s own specialized domain, as well as acquiring comprehensive and more highly specialized knowledge in aesthetics and art history. Students are expected to report on the results of their research and present their papers both inside and outside the department as opportunities arise and to accumulate experience as specialized researchers. Another requirement is to produce a doctoral thesis in the final year of the program, under the guidance of instructors. From time to time, each studio will hold lectures and courses in the form of seminars led by researchers from overseas. Support, guidance, and related materials are provided to allow each student to study overseas. In addition, depending on areas of specialization and research subjects, visiting researchers, government-sponsored and privately-financed overseas students, research students, and exchange students are accepted proactively, with three to five overseas students taking part in the program each year. Paths taken by students after graduation cover a wide range of fields, including publishing, curator work at art museums and other museums, art criticism, research in specialized domains, and education. For students seeking to become curators or instructors, courses are available for attaining the qualifications required in each of these professions.